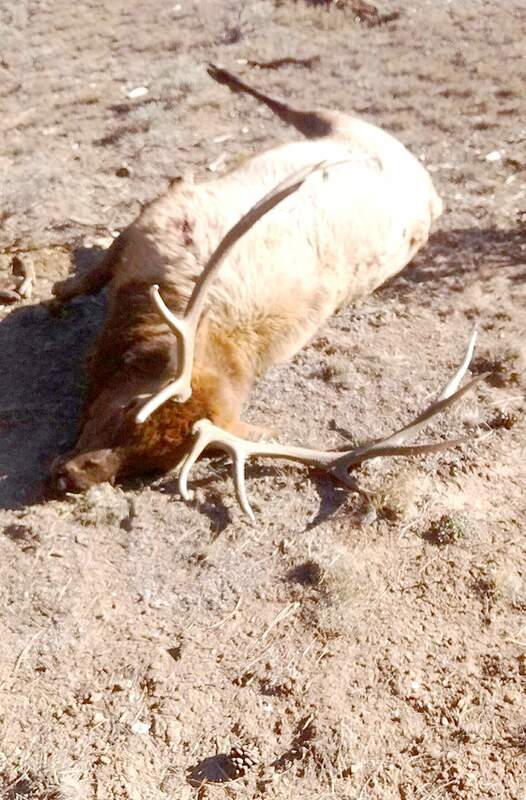 This and another trophy bull elk were killed and abandoned in the Sanborn Park area of the Uncompahgre National Forest northeast of Norwood. A $1,250 reward is being offered for information leading to an arrest or citation. Colorado Parks and Wildlife continues to seek information about two bull elk killed illegally northeast of Norwood in the Uncompahgre National Forest in early November. Now, a reward of $1,250 is being offered for information that leads to an arrest or a citation being written to the person or people who killed the bulls. Tips can be anonymous. Both bull elk had six-point racks, which indicated they were mature animals in prime breeding age. The animals, found in Game Management Unit 61 in the Sanborn Park area, were killed and left to rot early in the third rifle season, likely sometime from Nov. 3-8. Unit 61 is considered prime elk habitat, and to preserve the healthy herds and the hunting experience, license sales are limited. “People wait a long time to draw a tag there, and it is very disturbing that someone would illegally kill two prime bulls near each other,” said Joe Lewandowski, public information officer for Colorado Parks and Wildlife. The dead elk, which were killed well away from any forest roads, were spotted by a hunter who reported them to a local district wildlife manager. Evidence including a bullet has been recovered from the scene. There was no carcass tag attached to the animals, and the meat was not harvested as required, indicating that they were shot illegally. The antlers also were not harvested. The loss of two bull elk in prime breeding age is especially troubling because of struggling elk populations in Colorado, Lewandowski said. In addition to regular fines, the alleged poaching incident would also qualify for an additional $10,000 fine per bull elk under the Samson Law, a surcharge applied when trophy animals are poached. The law was passed after a popular bull elk in Estes Park was illegally killed inside city limits. Operation Game Thief, a Wildlife Crimestoppers organization, is offering a $1,000 reward, and Colorado Backcountry Hunters and Anglers is offering an additional $250. BHA is a nationwide organization with 1,700 members in Colorado and more than 20,000 members nationwide. “Backcountry Hunters and Anglers is an organization that promotes legal, ethical hunting and fair chase, so we are compelled to speak up on this terrible incident,” said Craig Grother, a member of the organization who lives in Norwood. Anyone with information about this crime against wildlife can make a report to the Montrose wildlife service center at 1-970-252-6000, or to Operation Game Thief at 1-877-265-6648. Informants can remain anonymous and are eligible for rewards.